Another place I should be prevented from going: the farmer’s market. If I want to stay solvent, that is. How can I help it? Everything is so green. And gorgeous. And good for you! If you eat it, that is. Which, half of the time, I don’t. Because those spectacular white onions I bought? You know, the huge ones with the slashes of purple down the sides? I have no idea what to do with them. Yes, they’d look beautiful in a Renoir still life, but that doesn’t give me a recipe idea. As for the three bunches of red-leaf lettuce, two broccoli rabes, and three Russian kales I shoved so picturesquely into my basket? More than we can possibly eat. The fennel still covered with crumbly, certified organic soil? Likely to be forgotten, until it’s found moping in the back of the crisper months down the road, boasting a grayish cast and the consistency of galvanized rubber. Then there are the fancier goods. I’m a complete sucker for them. The $20 pork chops? That was a disaster. The $12 honey that wouldn’t pour? Fabulous. Then there’s the artisanal cheese. Yesterday I bought a round of smoked mozzarella because, come on, everyone likes it, right? This stuff was special, too. Made on a farm, by a father and son who wear cute little hats. Coaxed from milk that’s coaxed from jubilant cows who’ve been coaxed by organic grass to make an extra creamy product. Sung to at night, for all I know. At ten dollars a ball it seemed only slightly preposterous. Until MJ and Mike both announced they wouldn’t eat it. At that point my wonder-ball of cheese became something very un-wonderful. Something farcical. Something nearly malevolent. I felt hate for it. I considered bringing it to the park and putting it in the ball thrower for the dog. But I knew I wouldn’t. I knew, instead, that I’d eat the whole thing myself. To “save” money. Even though, to be honest? It tasted gross. How could I pass that up? Especially when I spotted a jar of the stuff at the farmer’s market! At the Vietnamese vegan raw stand, no less. I might live to 110! So I bought a jar. Seven bucks. Hey, for that kind of longevity? A steal. Getting it home, I opened it up, took a big bite…and gagged. It was like eating wet mop. Unrinsed. Mike added vinegar for me to try to make it palatable. Unsuccessful. I will be living to my mid-eighties. And eating Trader Joe’s dill gherkins the whole way. If I can afford them, that is. If I keep out of the market I’ll have a chance. 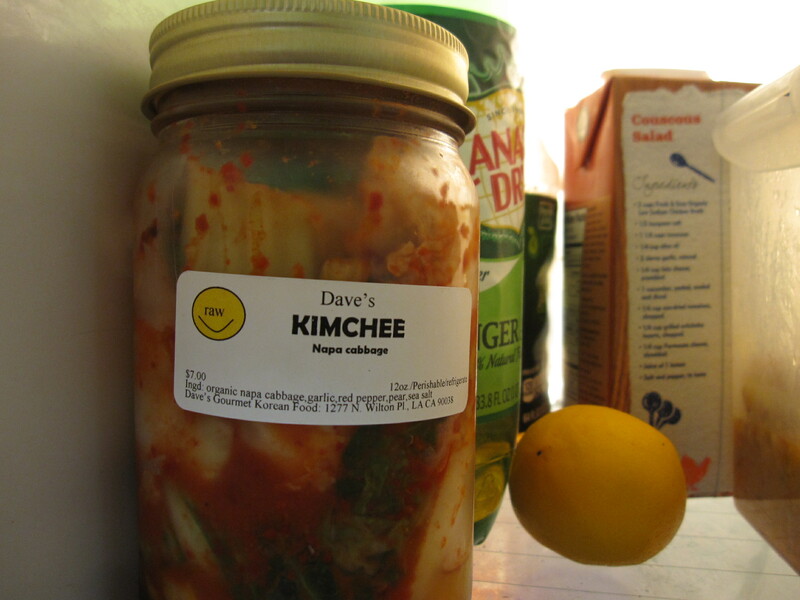 In the meantime, kimchee, anyone? For sale, cheap! This entry was posted in childcare, cooking, Outings, Shopping and tagged farmers market cheese, farmers market expensive, farmers market meat, farmers market produce, kimchee, kimchee taste on March 4, 2013 by thumbstumbler.